In 2018, we witnessed a pivotal point in our real estate market — a transition from hyper-active conditions to a normalized environment. MLA Advisory anticipates 2019 to be another dynamic year as we face cooling pressures from global giants and our own government, while continuing to see supply and affordability issues in the forefront. Amidst this unique climate, there will be challenges, but also opportunity for creativity. Report highlights include new statistics on the local pre-sale market, the impact of the city entitlement process and the increase to land and construction costs. “BC’s fundamentals remain stronger than elsewhere in the country. This means pressures on our housing market will continue, particularly with population increasing and housing starts declining. We must be progressive in our solutions to provide housing – the long-term viability of our cities depend on it.,” explains Cameron McNeill, Executive Director of MLA Canada. Population is expected to increase steadily in BC, with almost 50,000 new residents landing in our province in 2019. With job opportunities remaining high compared to other provinces, interprovincial migration will likely remain constant over the next 3 years. Steadily increasing international immigration to our province continues as foreigners still view BC as safe, secure, and livable. 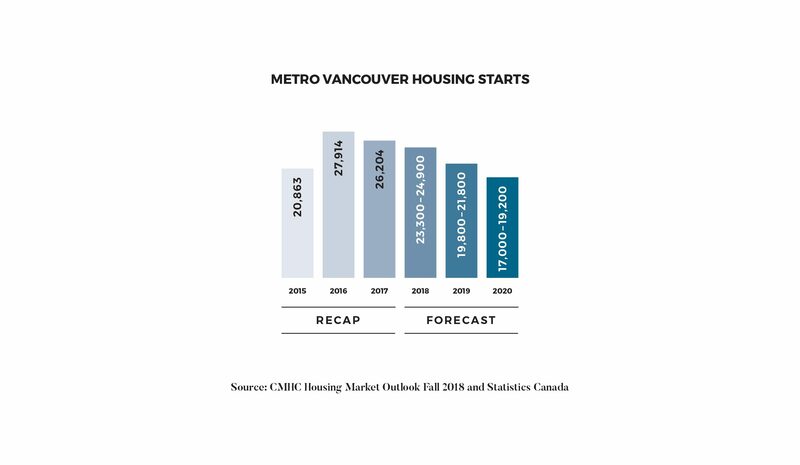 With steady population increases, housing starts are expected to decline in Metro Vancouver over the next 2 years, adding pressure to the housing market. Increased government regulation and taxation, elongated development timelines, and municipal bureaucracy make housing that much harder to produce in our cities. Approval timelines continue to be a major factor in our ability to appropriately address the demand for housing in Metro Vancouver. Vancouver, Burnaby, and the District of North Vancouver remain the municipalities with the lengthiest project approval timelines. The cost of construction has always been a vital variable in a project’s viability. Over the past 5 years, construction costs have risen nearly 50 per cent, on average, which, of course, is absorbed downstream by the consumer. In 2019, we could see a slight easing in the cost of construction, as some projects may be put on hold or pushed due to different factors, including market conditions, interest rates, or rezoning approvals. 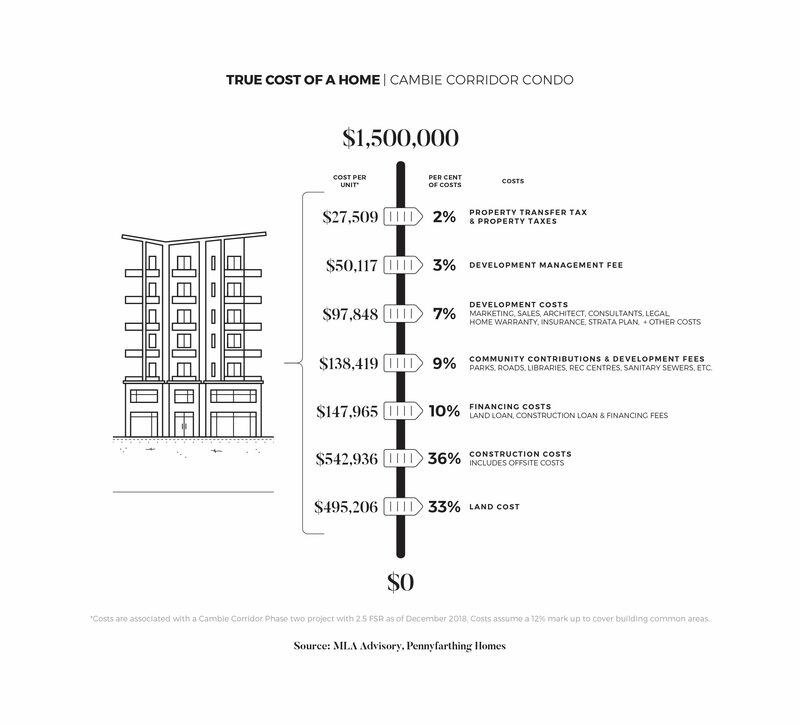 MLA Advisory breaks down the True Cost of a Home for a Cambie Corridor condo and findings show land and construction costs are the largest contributing factors at 69% of the total cost. Perhaps less well known, the government taxes and fees associated with projects, particularly in the case of the Cambie Corridor, can constitute 11 per cent or more of the cost. Looking ahead to 2019, we forecast 73 projects and 13,975 homes to be released. As inventory levels rise and projects take longer to sell, we anticipate some of these projects to be delayed due to market conditions. “2019 is expected to be highly competitive, but an overall balanced market with nominal price escalation will provide purchasers with choice and value.,” shares Suzana Goncalves, Chief Advisory Officer at MLA Canada. It is safe to say that the unsustainable and rapid market of 2017 is firmly behind us, and likely will not be experienced at similar levels for several years, if ever. 2018 was a transition year, as we turned from an extreme sellers’ market to a more normalized and fairly balanced one. Benchmark prices will remain stable overall, the result will likely be net increases of 0-2 per cent, with projects taking 9 months to hit presale targets and selling until completion. Primary end-users will again comprise the bulk of our buyers, enjoying more selection and time to find true value. Download the full 2019 MLA Market Intel here.